Students are encouraged to participate in exchanges between Mexico and South Africa. WITS UNIVERSITY is playing host to a new centre for Mexican studies that has been established to promote academic and cultural exchange between Mexico and higher education institutions in South Africa. The Mexican Studies Centre is a joint initiative between the National Autonomous University of Mexico (UNAM) and Wits and has three areas of focus: the promotion of the Spanish language, the promotion of culture and academic exchanges. The centre is hosted at the School of Literature, Language and Media and is currently being run by the cultural and administrative coordinator, David Ruiz Guzmán, as well as the academic dean at the centre, Dr Arturo Mendoza Ramos. While Ruiz Guzmán and Mendoza Ramos arrived from Mexico at Wits in May of this year, the centre officially started with its Spanish classes which it is running in conjunction with the Spanish department at Wits, on July 16. According to Mendoza Ramos, vice-chancellor Adam Habib “was a milestone in developing everything here”. Habib first approached the Mexican embassy in Pretoria two years ago with the idea of the initiative and once he is back from sabbatical, the centre is planning an official launch. When UNAM was first invited to open this office at Wits, Mendoza Ramos said that “one of our main concerns was to give support to the Spanish department”. The centre is also opening the first testing centre in South Africa which will provide a platform to obtain a SIELE certificate – currently the most comprehensive exam to certify one’s Spanish proficiency. There is the possibility of expanding this testing centre to other universities, the University of Cape Town being one university which has shown an interest in hosting a SIELE testing centre. 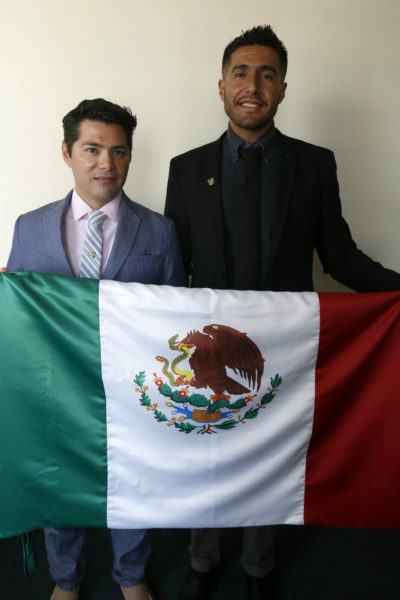 In order to promote the Mexican culture, the centre is planning numerous events, conferences and activities in which Mendoza Ramos says they want students to participate. Rodrigues arrived in South Africa on July 8 but is already making the most of his time here and has joined the rugby team which he says is a great experience. David Ruiz Guzman and Dr Arturo Mendoza Ramos from the Mexican Studies Centre. Photo: Sanet Oberholzer.